Early next week I will fly to London and visit that city for two months. 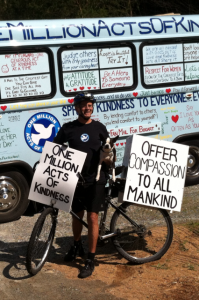 I will ride the Kindness Bicycle, raising awareness for kindness, compassion, respect and gratitude. Word of this mission is spreading across the globe and I wish to capitalize on it. Bogart will remain in the states with family and friends. The Blue Bird of Kindness will be parked on a very busy road where it will get thousands of views per day. Thank you to everyone who has made this trip a reality. This entry was posted on Sunday, May 25th, 2014 at 8:24 am	and is filed under Kindness. You can follow any responses to this entry through the RSS 2.0 feed. You can leave a response, or trackback from your own site.